The holiday season is upon us, and we are in the thick of our holiday party time here at Fellows Creek. We went clean and crisp for our decor this year, and it all started with this display by our front door. 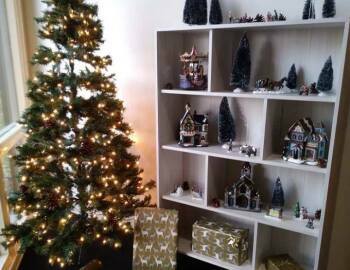 We set up a couple additional trees in the bar and banquet room along with other festive touches to ensure each party has that holiday feel they desire. We still have some open dates, so if you'd like to host a holiday party here in December or January please reach out to Brian Brown at BBrown@fellowscreekgolf.com. The temperatures have definitely dipped around here, and there is talk of the first accumulating snowfall of the season coming this weekend. We will keep the golf course open for play every day that we have less than an inch of snow on the ground, so keep us in mind if you get the urge this winter. Our golf shop hours are now 9am to 3pm, and whether we're letting out golfers or not we will be here if you'd like to pick up a gift card, buy a golf membership (10% off through January 31st), pick up some discounted gear, or just want to chat.